The space probe will look for alien worlds that might harbor life. NASA launched its new planet-hunting satellite into orbit Wednesday on a two-year mission to scour nearby star systems for alien worlds that might harbor life. TESS, short for Transiting Exoplanet Survey Satellite, lifted off at 6:51 p.m. EDT from the Cape Canaveral Air Force Station in Florida aboard a SpaceX Falcon 9 rocket. The launch was originally scheduled for Monday (April 16) but was postponed to allow time for "additional GNC analysis," a reference to the rocket's guidance, navigation, and control systems. Equipped with four specialized cameras, the $337 million satellite has a field of view that will cover 85 percent of the sky. This broad view will allow TESS to study about 20 million stars, according to Dr. George Ricker, the mission’s principal investigator and a scientist at the MIT Kavli Institute for Astrophysics and Space Research in Cambridge, Massachusetts. 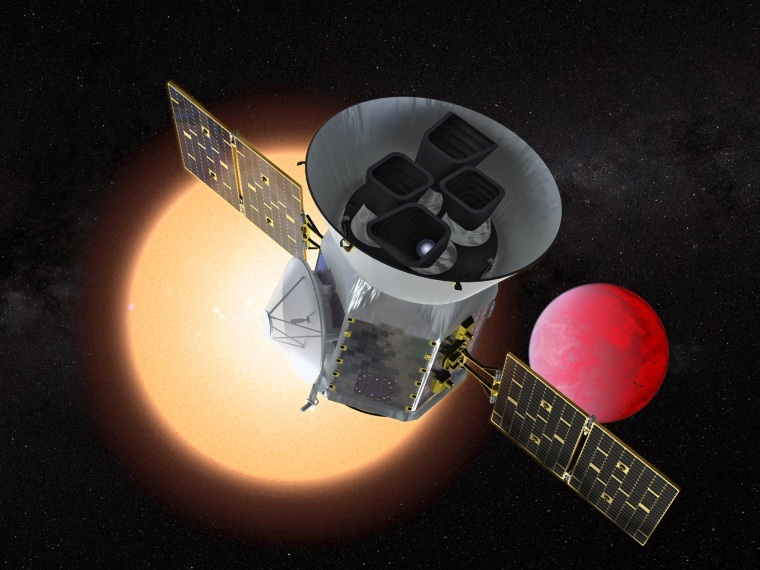 TESS will build upon the legacy of NASA’s Kepler Space Telescope, which launched in 2009 and has since identified more than 2,300 confirmed exoplanets. But TESS will be gazing at star systems that are much closer than those studied by Kepler, Ricker said. Like Kepler, TESS is designed to locate exoplanets by searching for what astronomers call transits. These are periodic dips in starlight that occur when a planet’s orbit takes it in front of its host star. Scientists will conduct follow-up observations of exoplanet “candidates” using powerful ground- or space-based observatories. These will likely include the James Webb Space Telescope, which is slated to launch in 2020. The Webb telescope is designed to examine the atmospheres of exoplanets to look for traces of oxygen, carbon dioxide, or methane — which could suggest the presence of life. "TESS will give us plenty of good targets for further study over many years to come," Dr. Matt Burleigh, a professor of astronomy at the University of Leicester, who is not involved with the TESS mission, told NBC News MACH in an email. "It will also help to tell us about the exoplanets around all our nearest stars — a census of our neighborhood in the galaxy." Burleigh said he's looking forward to seeing what TESS will uncover. "There are bound to be a few weird and wonderful worlds and solar systems to intrigue, excite and challenge our understanding of how planets form and evolve," he said. "The weird ones are often the most interesting!"